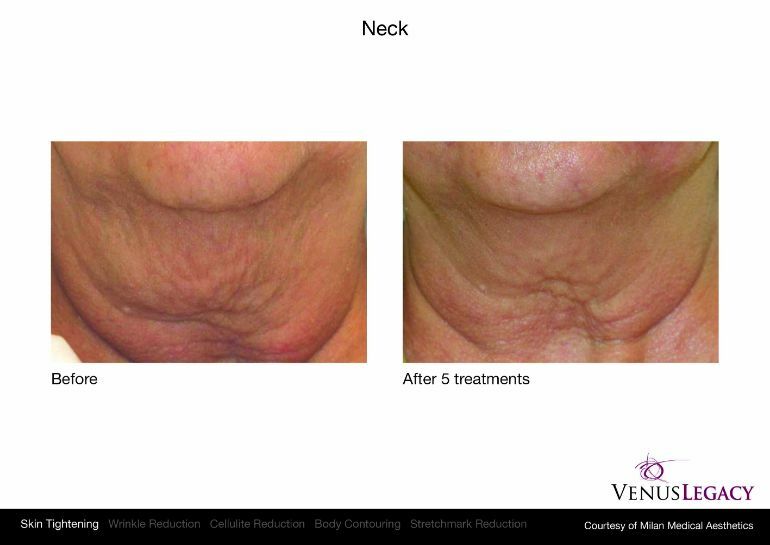 Venus Legacy at Nulook Beauty and Beauty Spa is once again energizing the industry with a revolutionary technology for non-invasive skin tightening, circumferential reduction, cellulite reduction, and wrinkle reduction. Multi-Polar Radio Frequency delivers fast, pain-free, homogeneous heating to multiple tissue depths, resulting in superior clinical outcomes. Pulsed Electro Magnetic Fields have been used in traditional medicine for decades and are scientifically proven with regard to their regenerative properties. Advanced VariPulse™ technology allows adjustable pulsed suction for deeper energy penetration, lymphatic drainage, as well as stimulating circulation. Real-time thermal feedback integrates a hands-free thermometer with on-screen visual feedback to allow constant tissue contact for better clinical results. 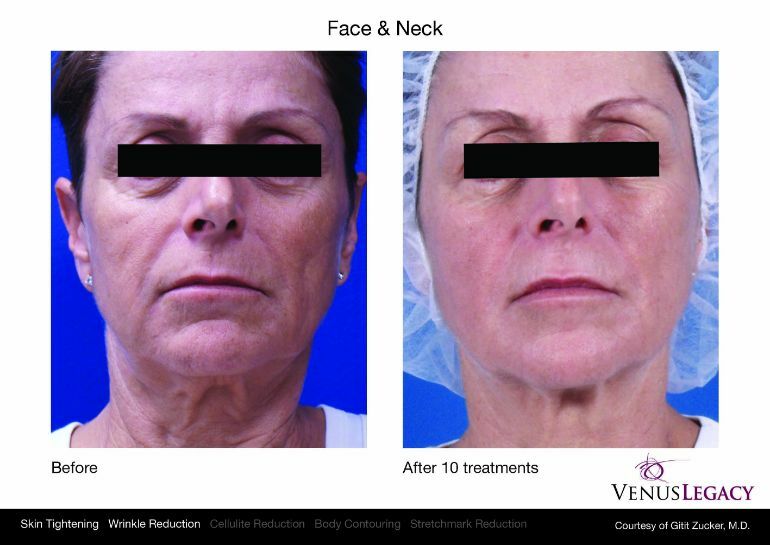 Venus Legacy Neck Treatment helps tighten the skin, reduce double chin and repairs droopy skin around the neck. This treatment repairs the wrinkle fine lines, sagging areas and improves blood circulation for healthy glowing skin. 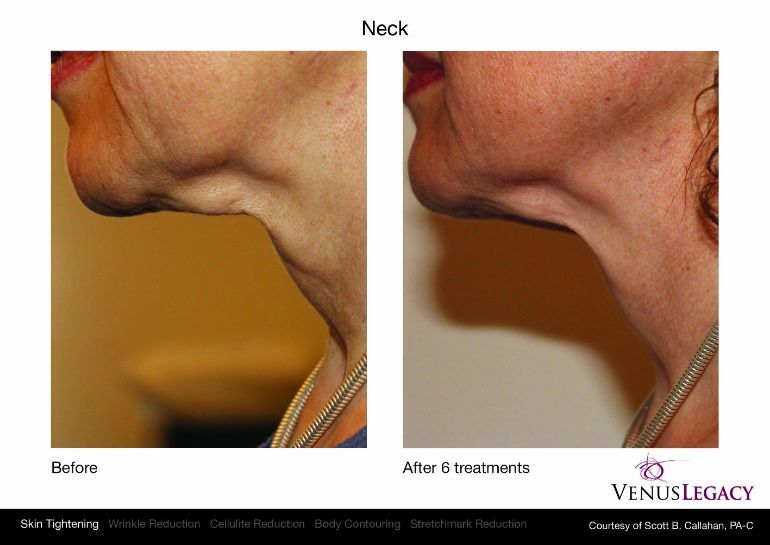 Venus Legacy Neck Treatment is safe and effective. 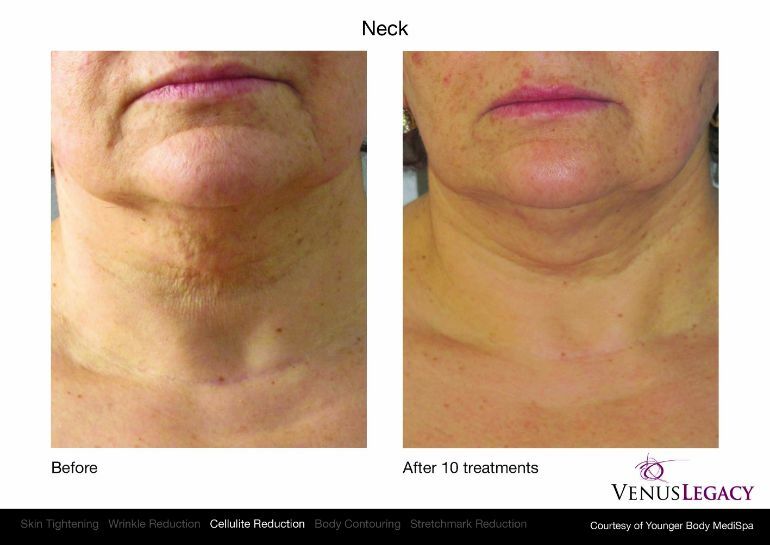 It is the best way to reduce fine lines, tighten the neck skin which is vital for a younger look. Nulook Beauty Spa’s Skin Tightening treatment makes this a trendy process for the face, eyes, neck, chest, arms, abdomen, and knees. Consider a skin tightening treatment at NulookBeauty and Medi Spa in Markham. We are always available for you! Venus Legacy™ features four applicators: OctiPolar™ and 4D Body for larger areas, and DiamondPolar™ and 4D Face for smaller areas. All four applicators are powered by proprietary (MP)2 technology with the synergistic combination of Multi-Polar Radio Frequency (RF) and Pulsed Electro Magnetic Fields (PEMF). The OctiPolar™ and DiamondPolar™ applicators are most suited for skin tightening and wrinkle reduction. The 4D Body and 4D Face applicators are equipped with novel VariPulse™ technology, which makes them most effective for body contouring and cellulite reduction.